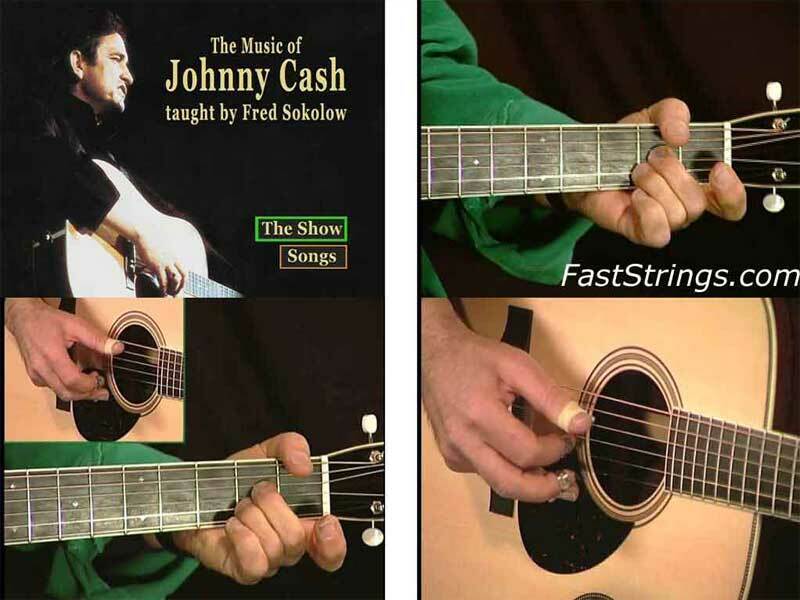 Fred Sokolow The Music of Johnny Cash. Johnny Cash left us a wonderful country songbook, and in this one-hour and twenty minute lesson Fred shows you how to play and sing eight of Cash’s most popular gems.You’ll learn to back yourself up singing, using basic fingerpicking patterns and first position chords, with lots of bass runs thrown in. You’ll also learn to fingerpick a solo for each tune. Fred grew up with Johnny Cash’s music, and his natural, easy arrangements suit the material and are easy to learn. After playing and singing each song, Fred goes over any tricky techniques or runs, then he plays the tune on a split screen so you can watch what each hand is doing. The booklet that accompanies this DVD has all the split-screen versions written out in tablature and standard music notation (with lyrics, too), so you can read the exact same arrangements Fred plays. Whether you’re a beginner or intermediate player, this DVD lesson is a great way to get into Johnny Cash’s songs – and carry on his legacy!